Over the past 2 decades PRINCE2® (PRojects IN Controlled Environments version 2) has been developed by the UK Government and internationally as the best practice project management method. PRINCE2 provides you with a complete set end to end process and the latest version recognises scaling for the needs of your project or organisation. The Project Results approach does not just focus on passing the exams but also on applying PRINCE2 after course completion. Paul Sutton, from Project Results uses many practical examples from his 20 years of experience as a hands-on project manager and adjusts the course delivery to meet the needs of the attendees. PRINCE2 is a Methodology which means it provides you with guidance on the steps you need to take to run a project and the things you need to be aware of and pay attention to. It is very strong on the concepts of projects sitting under a governance and control framework and being underpinned by a business case. This is to ensure that projects deliver what the sponsoring organisation wants in a way which that sponsoring organisation is comfortable with. In the latest release (2017 Edition) it introduces the concepts of "Tailoring" and "Embedding". Tailoring is where it is "scaled to fit" and Embedding is where it is fitted in with organisational processes. Training is based upon "Managing Successful Projects with PRINCE2" - 2017 Edition manual. This is an easy to read guide which will become your future project management reference. ​PRINCE2 is based on Principles (project management truths), Themes (the things you focus on) and Processes (project steps - see the diagram). 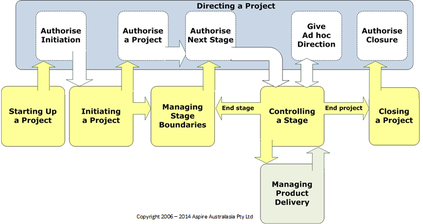 We take you through these to give you a complete picture of the project management process. PRINCE2 is becoming the de-facto standard in New Zealand and Australi​a. Because projects frequently fail to deliver expected benefits. Gartner studies suggest that 75% of projects are considered to be failures by those responsible for initiating them. Failure means that the solutions fundamentally did not do what was agreed or they missed deadlines and/or came in well over budget. More importantly, they failed to achieve the desired investment objectives and deliver expected benefits. Paul has an active consulting practice in Project Management and PRINCE2. PRINCE2 talks about "Tailoring" which should include "Sizing to Fit" but often Paul sees organisations "Upsizing" when what was needed was "Downsizing". In response to this Paul has developed "PRINCE2 Lite" which is a specific approach applicable to the size and scope of organisations in Aotearoa/New Zealand. Paul's training is threaded with real life examples, tools and techniques which are uniquely focused to the challenges of running projects in Aotearoa/New Zealand. ​Paul Sutton is committed to helping organisations raise their Business Case, Project, Programme and Portfolio capability. To do this Paul has been working with a wide range of organisations developing capability through training, coaching, consulting, process improvement and hands on delivery. Paul combines in-depth process knowledge with 20 years of pragmatic hands-on experience in business cases, project and programme management. Paul has a broad picture focus combined with strong analytical thinking. He is an excellent communicator in both oral and written forms. Along with being a highly experienced Project and Programme Manager has an active consulting and coaching practice which allows him to be current with real life needs. Paul has a flexible, dynamic and engaging delivery style and welcomes discussion on your real life issues which he threads into course delivery. As a result he is able to give practical application to a huge range of questions and scenarios focusing the course on the needs of the attendees. Paul is a Registered BBC, PRINCE2, PRINCE2 Agile and MSP trainer. He also holds the PMP (Project Management Professional) certification from PMI (Project Management Institute) and is a Gateway Reviewer. For the past four years Paul has been on the organising committee for the PRINCE2 Users Group. This industry group is intended as an ideas sharing and capability building forum for the users of BBC, PRINCE2, MSP and other UK government approaches. Paul is also an active member of PMI. When you get your PRINCE2 Foundation certification that is permanent. Great news. PRINCE2 Practitioner certification is slightly different. When you get that you can call yourself a "Registered PRINCE2 Practitioner" for 3 years and after that you can only call yourself a "PRINCE2 Practitioner"
You retain your "Registered PRINCE2 Practitioner" status for 3-5 years (depending upon the version). After this you will need to resit the Practitioner exam again . Remember you can't call yourself a "Registered PRINCE2 Practitioner" once your status expires". You will need to determine the professional implications of this on you. The classroom courses are run in quality venues with full catering. All course material is provided during the course and may be provided prior to the course, if requested. Day 1 refreshes you in the PRINCE2 curriculum. It will be action packed because we are condensing 2.75 days of the Foundation course into 1 however this is achievable because we are simply refreshing what you learnt when you studied for Foundation and Practitioner. ​At the end of Day 1 we take you through Practitioner exam techniques. Between the 2 days you will complete the AXELOS sample exams. We give you the full Practitioner exams as they are longer and give you more questions to practice. There are two in total and each has a duration of 2.5 hours. So you can expect to spend at least 5 hours on this plus more time for revision. For those who want more Geoff has produced a large collection of Practitioner style exam questions as part of our Practitioner course and we let you have these. ​Day 2 is a full. In the first part we review you exam practice and focus on questions and curriculum areas you are unsure of. The 2.5 hour exam is sat in the afternoon of this course. Post course access to our unique set of templates and guides. You are also fully supported by us before and during the course. Our experience is that the 1.5 day format is a good trade off of time, cost and outcomes. Others may run longer courses but we think this is an overkill. As a person who has previously passed Practitioner we expect you to have little trouble refreshing yourself on PRINCE2 and passing the exam. PRINCE2 Re-registration Day 1 - Friday 5 April 2019 (05/04/2019) - 8:45am - 5:00pm. Our course price $1,195 including everything outlined on this page. ​Note that all prices are quoted excluding GST and that invoicing will be at the time of course booking. If you require we can also provide quotations for in-house options. If booking Practitioner only options you must have previously passed the Foundation exam. Credit card payments have an additional 3.5% charge. In choosing a course we want people to be fully informed of their options. If you are simply happy to study on your own, without our support, you can buy the exam directly from another provider. If you qualified prior to January 2001 (approximately) your PRINCE2 Practitioner will not have an expiry date. We have clarified this and essentially you have the same status as an expired "Registered PRINCE2 Practitioner" in that you can only call yourself a "PRINCE2 Practitioner". You an however take up the "Registered PRINCE2 Practitioner" status by sitting (and passing) the Re-registration exam. Our PRINCE2 courses are certified by the examination body, PEOPLECERT. This certification covers the PRINCE2 content as well as preparation for the Foundation and Practitioner exams. We would love to help you choose the right option or quote for a specific option. So please choose one of the options below and we will get in contact with you.